The word saffron takes its origin from the Arabic ZOFERAN, no one can say exactly where the saffron has appeared from the first time; It started to be cultivated in the Mediterranean coasts after the Arabic invasion of the Spanish peninsula. Then the Saracens have contributed to its diffusion. 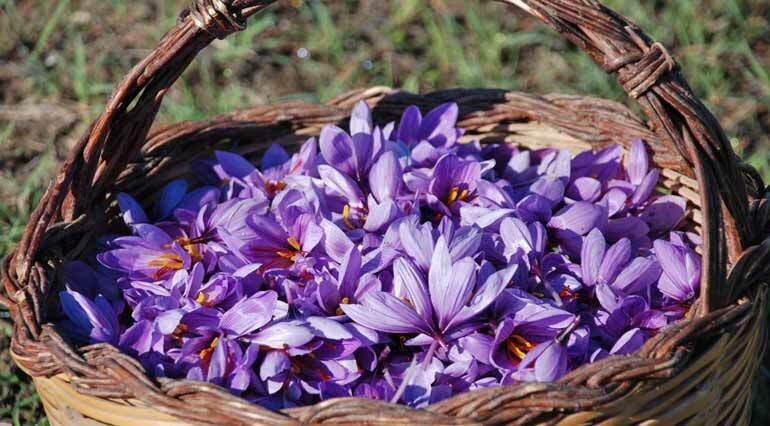 The production of Saffron in Abruzzo, more precisely in the area of Navelli, is very ancient and the quality is considered one of the best in the world. Saffron is the dried yellow stigmas of the violet flowers of Crocus sativus, a member of the Iris family. This plant (tuber- bulb), transplanted in August starts to bloom in October. The saffron flower has a colour shade that vary from lilac to dark purple; inside its corolla there are 3 little red pistils, from which the saffron is produced. 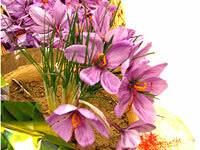 Cultivation, harvesting and processing of saffron are rigorously done manually. Its cultivation still follows the millenary technique, and the harvesting, which occurs in the brief period of blooming, is manually done in the early morning, before the flowers are completely open. 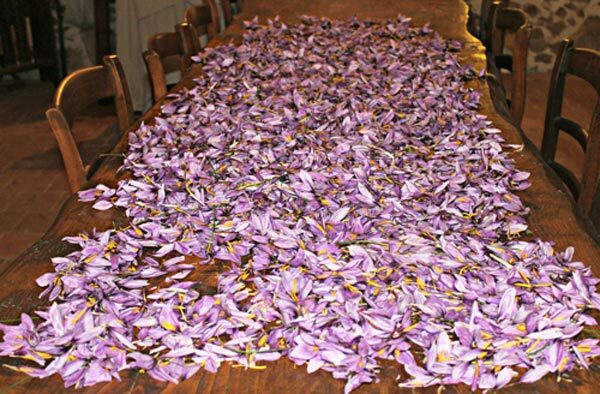 To obtain a kilogram of saffron 180.000 flowers have to be picked up, and more than 500 hours are necessary to process the work. From 20 flowers can be obtained 60 pistils. A saffron bag normally contains 60 dried out pistils. This spice can be used for culinary purposes and also as a medical treatment, in fact saffron is considered as one of the most powerful natural antioxidant thanks to the high level of carotenoids contained in the pistils. In phythotherapy it is utilised for its detoxify properties and Chinese medicine uses it for its depurative properties. Saffron is the most expensive spice in the world. The ancient Assyrians used saffron for medicinal purposes. The Greeks and Romans used it to perfume their luxurious baths. The bright orange-yellow color also made saffron useful as a dye. Saffron has a strong perfume and a bitter, honey-like flavor. The taste is pleasantly spicy and bitter and the odor is tenacious. • 2 teaspoons tomato paste. 1. Season the chicken with salt and pepper and brown it on all sides in butter. 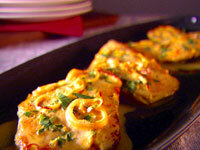 Sprinkle with thyme and add the bay leaf, saffron and cream. 2. Cover the skillet and simmer for 25 to 30 minutes, or until chicken is tender. Taste the sauce for seasoning and add more salt and pepper if necessary. If you are a tea lover and drink herbal tea, here is an excellent recipe that brings an exotic aroma and seductive flavour to your tea while lifting up your spirit and saving you money compared to those expensive herbal teas. • Smell your tea. 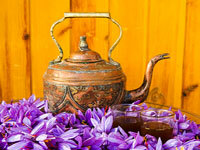 You can unmistakably smell the great aroma of saffron tea. CAUTION: Do not drink more than a cup a day. Always start with a small amount and test it. Keep in mind that saffron is also a drug and like any other drug, overdosing has serious health hazards. Consumption of few grams at once by a single individual may cause kidney failure, paralysis of nervous system and death.